“Play time is over,” says President Tom Kirkman (Kiefer Sutherland) to Aaron Shore (Adan Canto), his special advisor, after meeting with the Russian and Ukrainian ambassadors about a terrorist hijacking in the second season opener of ABC’s popular political thriller, Designated Survivor. As episode one begins, Kirkman is in the new rebuilt Capitol one year after it was attacked. He talks to Special Agent Ritter (LaMonica Garrett) about the history of the building and what it means to the country. They head back to the White House where Emily (Italia Ricci) is waiting for Kirkman to interview Lyor Boone (Paulo Costanzo) to see if he’ll work out as the new political advisor. After going back and forth briefly on how bad Kirkman is at getting his message across to the public, the President agrees to try Boone out on a trial basis but only because he speaks his mind, something Kirkman respects. The meeting ends when the President is made aware of a new crisis. Ukrainian terrorists have hijacked a Russian plane in Chicago, and 68 of the 165 hostages on board are American. Kirkman doesn’t hesitate and sends Emily and Aaron to speak with the Russian and Ukrainian ambassadors in an attempt to handle the problem diplomatically and avoid a possible altercation that could spark a war between Russia and Ukraine. Unfortunately, neither ambassador is willing to do anything to help. The Russian ambassador tells Emily they do not negotiate with terrorists, and the Ukrainian ambassador tells Aaron he resents being implicated and tied to terrorists just because they are citizens of Ukraine. Meanwhile, Agent Hannah Wells (Maggie Q) is in Amsterdam tracking America’s most wanted man, Patrick Lloyd, the man behind the Capitol bombing. Acting drunk, Wells gets picked up and taken home by a patron at a bar. Once he gets her to his place, Wells knocks him out and begins going through his apartment and finds a USB drive. She calls Chuck Russink (Jake Epstein) and by plugging the drive into her phone, Chuck is able to check it out. He informs Hannah it’s full of addresses and that each location matches a node of the dark web. Hannah checks the location out and isn’t there long before the guy from the bar shows up behind her holding a gun. To Wells’ surprise, the man isn’t just some jerk from the bar but an MI6 agent named Damian Rennett (Ben Lawson). He’s after Lloyd for a few crimes he committed when he was in England. The unlikely pair decide to throw in together and hunt Lloyd as partners. Back in D.C., Seth (Kal Penn) goes to a job interview, mostly because he feels he’s unimportant at the White House and doesn’t really accomplish anything that matters. Seth returns to the White House to handle the press briefing about the plane hijacking and it goes rather badly. He gets short-tempered with the press asking questions about the manhunt for Patrick Lloyd. Later, Emily talks to Seth about the press briefing and Seth confesses he went to a job interview earlier in the day. Surprised and a little hurt, at first Emily believes Seth is looking to jump ship. But when Seth tells her what he does doesn’t really matter, she informs him he matters to her. “Either you’re all in or you’re all out,” says Emily. She gives Seth until the end of the day to decide or she’ll decide for him. Alex (Natascha McElhone) checks on Tom to see how he’s doing and he reveals he recognized one of the passengers on the plane as his ex-best friend from years ago. Tom’s worried that if the terrorists make the connection, they will have a bargaining chip to use. Things get yet worse when the Russians start sending troops to the Ukraine border. President Kirkman reaches out to the UN but the Secretary General informs the President he doesn’t think the UN can offer any assistance and that neither side is willing to help. It seems almost as if they wanted it to escalate. Kirkman realizes this is on purpose and has Aaron do some digging. Sure enough, Aaron comes up with proof the terrorists have been paid by the Russians so their country can start a war with Ukraine. President Kirkman has a brief meeting with the ambassadors, revealing to the Russian ambassador he knows the Russians hired the hijackers. The ambassador tries to make a vague threat about friendship and alliances, but the President counters by telling both ambassadors that if one hostage is killed he will cut off all diplomatic ties with both Russia and Ukraine. “When your country leaders ask me why, the two names I will give them are yours,” says the President in Russian, dismissing both ambassadors. Back in Amsterdam, Wells and Rennett follow their only lead: the location of Lloyd’s computers. They head to that location but the area is empty. Wells checks in again with Chuck who pieces together that the computers were meant to help a supercomputer. He’s able through his tech magic to find the location of the supercomputer. Wells and Rennett make it to that location and find a slew of phony passports and realize that they missed Lloyd…he’s gone. Back in D.C., the President gets word the terrorists have let the hostages go and have surrendered. Seth delivers the news to the press and as he ends, he gives them a spirited heartfelt speech about President Kirkman and how hard he works every day to try to live up to what the American people expect of him and how much he believes in his country and the people. As Seth walks away, he says “Buya!” to Emily, indicating he’s decided to stay. Aaron, Seth, and Emily head to the Oval Office to tell President Kirkman they don’t think that Boone is going to work out as part of their team. (Throughout the episode Boone kept popping off to them with weird/blunt remarks on how they do their jobs badly.) As the united three walk in, they discover Boone is with the President and Kirkman tells them their timing couldn’t be better. Kirkman tells Boone to go ahead and Boone points out to each of them how they could have handled the hijacking crisis better, and in one particular case actually made it worse. Boone says he wants to stay and work with them, believing he can really help. Realizing everything Boone said was correct, they agree. President Kirkman also agrees and has already hired Boone on. Another tragedy strikes and President Kirkman gets word that a spark from the runway caused a sick passenger’s oxygen to explode, killing the elderly person and the doctor who was helping him, Kirkman’s ex-best friend. Tom’s feeling terrible until he finds out from Alex that she reached out to the man’s wife and found out he never held a grudge against Tom over their disagreement years ago. A little later, Kirkman thanks his staff for all the hard work they did and gives a brief speech on helping the American people. The last scene in the episode takes place outside on the street where a man is standing looking at the lit-up rebuilt Capitol. He turns and we see it’s Patrick Lloyd. 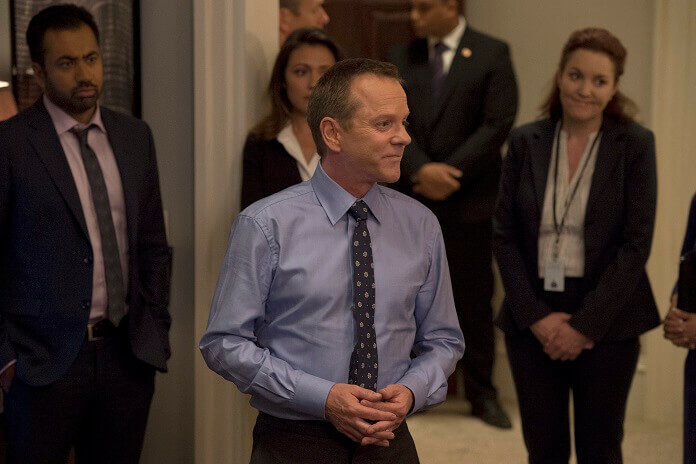 Engaging and fast-paced, the Designated Survivor season two premiere, “One Year In,” brings back the well-written political thriller complete with strong performances, a new international crisis, the continued manhunt for Lloyd, and some uneven and light humor. Once again Kiefer Sutherland shines as President Tom Kirkman who’s still working hard at getting the American public to believe in him and, more importantly, their government. Sutherland shows how Kirkman is truly up to the challenge of politically fighting against powerful men who have their own agendas in play, in this episode that’s the case with the ambassadors from Russia and Ukraine. The scene in which he calls them out and warns them if anyone loses their lives he will make sure it’s their careers that are destroyed, is pitch perfect and extremely satisfying. The only drawback to the episode is the introduction of the character Boone, who’s to be the new political advisor. The character brings awkward and unnecessary humor and levity to a dramatic and intriguing show, and the series doesn’t benefit from the character’s insertion. To be honest, it feels forced and out of place. With Lloyd back in D.C., Wells still in Amsterdam, and President Kirkman looking to move the country forward, it should be very interesting to see where the series goes from here and what new threats the White House will have to face.